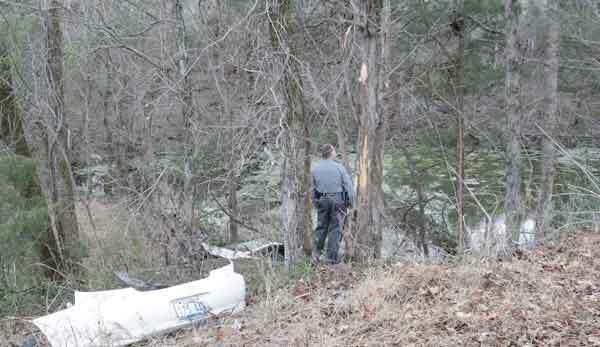 An Adair County woman died from a car wreck on Greensburg Road Saturday and numerous local law enforcement officers were on the scene for more than four hours as police reconstructed the incident. Kentucky State Police has not officially released information from the wreck but the Community Voice learned that Alesha Morrison and Sam Edwards were in the single-vehicle wreck that occurred around 3:45 p.m. Saturday. The car was traveling northbound when it ran off the road just before Burton Garmon Road, traveling across the roadway then flipping several times before going airborne through trees and landing in a pond. Adair County Sheriff’s Office, Columbia City Police, Kentucky State Police, EMS and the Adair County Fire Department all responded. The roadway was closed for several hours as KSP reconstructed the wreck. More will be posted as it becomes available.